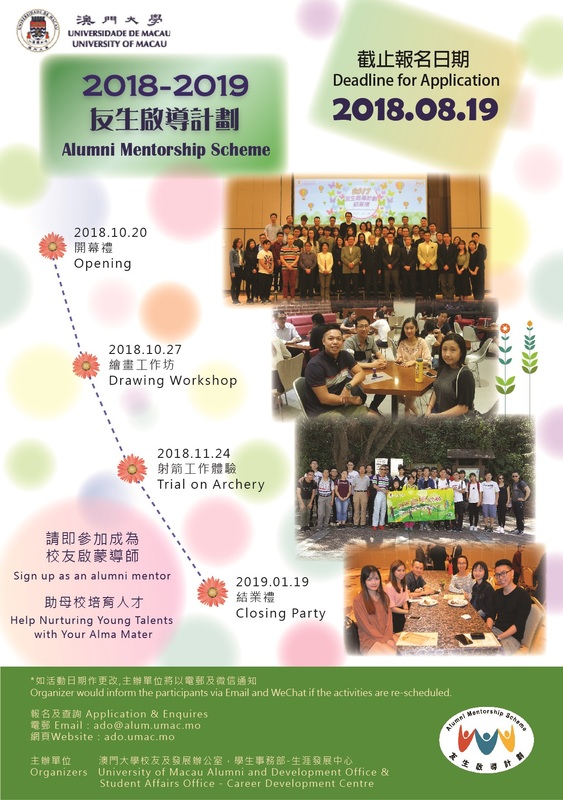 “2018-2019 Alumni Mentorship Scheme” which is co-organized by the Alumni and Development Office and Student Affairs Office – Career Development Centre, are now recruiting alumni who are passionate and devoted to join us as our mentor. All UM alumni are welcome to join us to share your experience and insight on further study, career direction or life planning with our students. We are looking forward to your participation. For details, please refer to poster. Interested alumni please fill in the application form (click here) and return it to us by email (ado@alum.umac.mo) or fax (+853 8822-2316) on or before 19 August 2018. If you want to know more about the scheme, please feel free to call Mr. Daniel Cheong/ Ms. Jane Kuok at (+853 8822-4244).